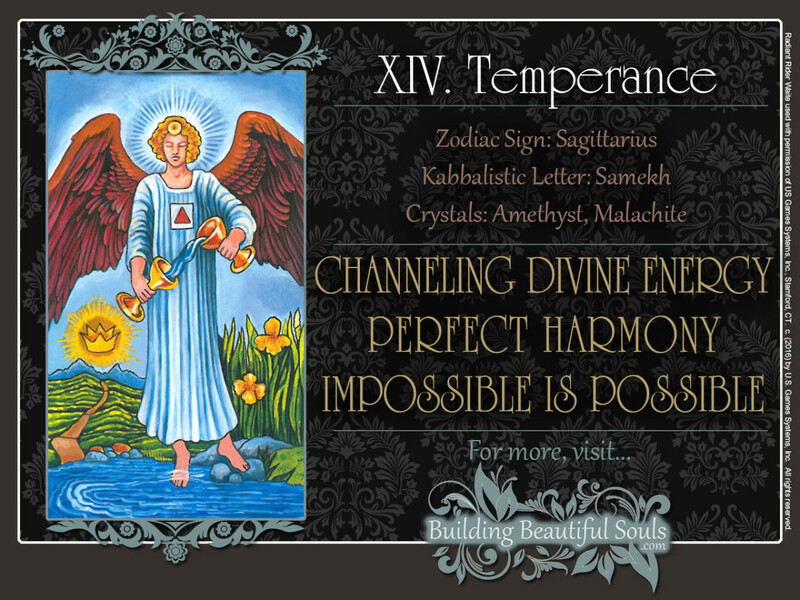 The Temperance card is the most “Zen” card of the Tarot and one of the most spiritual. In a state of perfect balance, difficult things become easy and the impossible becomes possible. Before you know it, doors you believed closed are wide open and the path before you is clear of previously insurmountable obstacles. Having quieted the turmoil within, your senses and mind are now open to what the universe has to offer. Whoa! Easy does it there, Ramjet. Combining Fire and Water symbols as well as male and female aspects of deity, the Temperance tarot represents the act of tempering, from which it receives its name. In this process, heated metal is immersed in water to harden or soften it. The angel Gabriel combines Water, Fire, and deity in the same figure on the Temperance tarot card. Because polar opposites are being merged under divine guidance, the Temperance tarot card also symbolizes healing and inspiration. The solar disk on his brow represents divine fire and the upright triangle on his breast, elemental fire. The triangle’s orange color points to its solar origin, while the azure of the robe, associated with the planet Jupiter, symbolizes divine mercy on the Temperance tarot. Shown on the Temperance tarot card with one foot in the water and one on dry land, he bridges the subconscious, intuitive mind with the higher self. The angel has opened his channel to a higher knowledge, and this allows him to do the seemingly impossible. For example, he can pour fluid from one cup to another on the Temperance tarot card at such an odd angle without spilling a drop. Cups not only represent the Element of Water, but also the feminine aspect of creation, the divine womb. On the right side of the Temperance card is a field of Irises, symbolizing the divine mind reaching out to humanity. On the left, an unobstructed path gently slopes toward a pass in the mountain range on the horizon. It leads straight back to the divine consciousness. Rather than being balanced against one another, the Temperance tarot merges polar opposites. Answers and insights are coming to you in quick succession. Energy flows through you freely, gaining momentum, building up, and finding its release at just the right moment! Just as the heavenly archer Sagittarius, associated with the Temperance tarot, you have become the arrow and the target, the draw and the release. Balance, focus, and perfectly paced movement have become one process. If you have wondered, whether the water flows from the right cup to the left or in the opposite direction, note that there are actually two streams: the water flows both ways. Your divine guardian and your higher self are in perfect communication with one another because you’ve stopped being hung up on results and consequences. You are hearing every word, and the news is good. An obsession with consequences puts obstacles in your path, and these obstacles are stumbling blocks, not stepping stones. It focuses your attention on the wrong things. Letting go of this attachment allows your mind to receive new insights. Consequently, these insights also bring a tremendous peace of mind. This inner peace comes from the knowledge that you are in the right place at the right time, doing the right thing – and the universe is responding in kind, opening doors to opportunities and success. With peace of mind comes well-being. Gabriel is the heavenly physician and therefore, this card often is a message of healing on all levels of your existence. According to the ancient Romans, a healthy body results in a healthy mind. And a healthy mind can heal the body. Is it that you are feeling overwhelmed by the messages you’re receiving or that you can’t bear the light? Your guardian angel is standing before you in its brilliant glory, kinda like Roma Downey in Touched by an Angel, telling you that the universe loves you. But you’re in doubt, although this information is coming straight from the top. After all, what’s to love about you? You have been paying so much attention to everything and everyone around you that you have neglected yourself almost to the point of abuse. Worrying about what makes others happy and what they think, you have ignored your own wants and needs. You’re running on empty from putting out fires everywhere, withdrawing into your shell at the wrong times and lashing out with unexpected bursts of anger. That’s because your body and mind are desperately trying to pull the brakes, reacting with physical or even mental illness. You may wonder why people seem to push you away, despite everything you are doing for them. The truth is that no one really likes a martyr. You need to return to your center so that you can set things right with yourself. In fact, that is the alchemical secret of the Philosopher’s Stone, a mystical substance said to turn lead into gold – and an important principle embodied by this card. Even if alchemy is not your cup of tea, this is a powerful metaphor. Here’s the formula: Travel to the interior of the earth. Through the process of correction, you will discover the hidden stone. What you’re correcting is your perception of yourself: You are important, and your wants and needs matter very much. Sound like a tough pill to swallow? That’s why the original Latin phrase (visita interiorae terrae rectificando invenies occultum lapidem) is abbreviated VITRIOL. This medicine may be bitter, but in the end it will restore your health. The Temperance tarot card is the fourteenth Major Arcanum. 14 is composed of 1 (the solar fire) and 4 (stability and balance), and added together, these numbers make the Number 5 (1+4=5), symbolizing sudden movement in a new direction.